Kamose was the last king of the Theban Seventeenth Dynasty. He was possibly the son of Seqenenre Tao and Ahhotep I and the full brother of Ahmose I, founder of the Eighteenth Dynasty. His reign fell at the very end of the Second Intermediate Period. Kamose is usually ascribed a reign of three years (his highest attested regnal year), although some scholars now favor giving him a longer reign of approximately five years. His reign is important for the decisive military initiatives he took against the Hyksos, who had come to rule much of Ancient Egypt. His father had begun the initiatives and, quite possibly, lost his life in battle with the Hyksos. It is thought that his mother, as regent, continued the campaigns after the death of Kamose and that his full brother made the final conquest of them and united all of Egypt. Drawing of a scarab of Kamose by Flinders Petrie. There is no evidence to support Pierre Montet's assertion that Kamose's move against the Hyksos was sponsored by the priesthood of Amun as an attack against the Seth-worshippers in the north (i.e., a religious motive for the war of liberation). The Carnarvon Tablet does state that Kamose went north to attack the Hyksos by the command of Amun, but this is simple hyperbole, common to virtually all royal inscriptions of Egyptian history, and should not be understood as the specific command from this deity. Kamose states his reasons for an attack on the Hyksos was nationalistic pride. He was also likely merely continuing the aggressive military policies of his immediate predecessor, Seqenenre. In Kamose's third year, he embarked on his military campaign against the Hyksos by sailing north out of Thebes on the Nile. He first reached Nefrusy, which was just north of Cusae and was manned by an Egyptian garrison loyal to the Hyksos. A detachment of Medjay troops attacked the garrison and overran it. The Carnavon Tablet recounted this much of the campaign, but breaks off there. Nonetheless, Kamose's military strategy probably can be inferred. As Kamose moved north, he could easily take small villages and wipe out small Hyksos garrisons, but if a city resisted, he could cut it off from the rest of the Hyksos kingdom simply by taking over the city directly to the north. This kind of tactic probably allowed him to travel very quickly up the Nile. A second stele also found in Thebes, continues Kamose's narrative again with an attack on Avaris. Because it does not mention Memphis or other major cities to the north, it has long been suspected that Kamose never did attack Avaris, but instead recorded what he intended to do. Kim Ryholt recently has argued that Kamose probably never advanced farther than the Anpu or Cynopolis Nome in Middle Egypt (around the Faiyum and the city of Saka) and did not enter either the Nile Delta, nor Lower Egypt proper. According to the second stele, after moving north of Nefrusy, Kamose's soldiers captured a courier bearing a message from the Hyksos king Awoserre Apopi at Avaris to his ally, the ruler of Kush, requesting the latter's urgent support against Kamose. Kamose promptly ordered a detachment of his troops to occupy and destroy the Bahariya Oasis in the western desert, which controlled the north-south desert route. Kamose, called "the Strong" in this text, ordered this action to protect his rearguard. Kamose then sailed southward, back up the Nile to Thebes, for a joyous victory celebration after his military success against the Hyksos in pushing the boundaries of his kingdom northward from Cusae past Hermopolis through to Sako, which now formed the new frontier between the seventeenth dynasty of Thebes and the fifteenth dynasty Hyksos state. Line 7-8: I placed the brave guard-flotilla to patrol as far as the desert-edge with the remainder (of the fleet) behind it, as if a kite were preying upon the territory of Avaris. Line 15: I have not overlooked anything belonging to Avaris, because it (the area which Kamose was plundering) is empty. The Second Stela of Kamose is well known for recounting that a Hyksos messenger was captured with a letter from Apophis—appealing for aid from the king of Kush against Kamose—while travelling through the western desert roads to Nubia. The final evidence that this king's military activities affected only the Cynopolite nome, and not the city of Avaris itself, is the fact that when Kamose returned the letter to Apophis, he dispatched it to Atfih which is about a hundred miles south of Avaris. Atfih, hence, formed either the new border or a no-man's land between the now shrunken Hyksos kingdom and Kamose's expanding seventeenth dynasty state. Furthermore, Kamose states in his second stele that his intention in returning the letter was for the Hyksos messenger to inform Apophis of the Theban king's victories "in the area of Cynopolis which used to be in his possession." This information confirms that Kamose confined his activities to this Egyptian nome and never approached the city of Avaris itself in his Year 3. Kamose is known to have campaigned against the Kushites prior to his third year since the Hyksos king directly appeals to his Kushite counterpart to attack his Theban rival and avenge the damage which Kamose had inflicted upon both their states. It is unlikely that Kamose had the resources to simultaneously defeat the Kushites to the south and then inflict a serious setback on the Hyksos to the north in just one year over a front-line that extended over several hundred kilometres. Illustration of a votive barque attributed to Kamose. Two separate rock-inscriptions found at Arminna and Toshka, deep in Nubia, give the prenomen and nomen of Kamose and Ahmose side by side and were inscribed at the same time—likely by the same draughtsman—according to the epigraphic data. In both inscriptions "the names of Ahmose follow directly below those of Kamose and each king is given the epithet di-ˁnḫ, Given Life, which was normally used only of ruling kings. This indicates that both Kamose and Ahmose were ruling when the inscriptions were cut and consequently that they were coregents. Since Kamose's name was recorded first, he would have been the senior coregent. 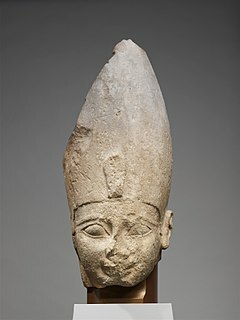 However, no mention or reference to Ahmose as king appears in Kamose's Year 3 stela which indirectly records Kamose's first campaign against the Nubians; this can only mean that Kamose appointed the young Ahmose as his junior coregent sometime after his third year prior to launching a second military campaign against the Nubians. As a result, Kamose's second Nubian campaign must have occurred in his Year 4 or 5. The target of Kamose's second Nubian campaign may have been the fortress at Buhen which the Nubians had recaptured from Kamose's forces since a stela bearing his cartouche was deliberately erased and there is fire damage in the fort itself. A slightly longer reign of five years for Kamose has now been estimated by Ryholt and this ruler's timeline has been dated from 1554 BC to 1549 BC to take into account a one year period of coregency between Ahmose and Kamose. Donald Redford notes that Kamose was buried very modestly, in an ungilded stock coffin which lacked even a royal uraeus. This may imply that the king died before he had enough time to complete his burial equipment presumably because he was engaged in warfare with his Kushite and Hyksos neighbours. The mummy of Kamose is mentioned in the Abbott Papyrus, which records an investigation into tomb robberies during the reign of Ramesses IX, about 400 years after Ahmose's interment. While his tomb was mentioned as being "in a good state", it is clear that his mummy was moved at some point afterward, as it was discovered in 1857 at Dra' Abu el-Naga', seemingly deliberately hidden in a pile of debris. The painted and stuccoed coffin was uncovered by early Egyptologists Auguste Mariette and Heinrich Brugsch, who noted that the mummy was in very poor shape. Buried with the mummy was a gold and silver dagger, amulets, a scarab, a bronze mirror, and a pectoral in the shape of a cartouche bearing the name of his successor and brother, Ahmose. The coffin remains in Egypt, while the dagger is in Brussels and the pectoral and mirror are in the Louvre, Paris. The name of the pharaoh inscribed on the coffin was only recognized fifty years after the original discovery, by which time the mummy, which had been left with the pile of debris on which it was found, was almost certainly long lost. ^ a b "Cambridge 2:1 290"
^ a b c James, T.G.H. Egypt: From the Expulsion of the Hyksos to Amenophis I. in The Cambridge Ancient History, vol. 2, part 1, ed. Edwards, I.E.S, et al. p.291. Cambridge University Press, 1965. ^ "The Abbott Papyrus". reshafim.org.il. Retrieved 2007-01-04. Wikimedia Commons has media related to Kamose. Simpson, William Kelly (Editor). The Literature of Ancient Egypt: An Anthology of Stories, Instructions, Stelae, Autobiographies, and Poetry (3rd edition). New Haven, 2003, pp. 345-50 (translation of the Kamose texts). Seqenenre Tao, called 'the Brave', ruled over the last of the local kingdoms of the Theban region of Egypt in the Seventeenth Dynasty during the Second Intermediate Period. He probably was the son and successor to Senakhtenre Ahmose and Queen Tetisheri. The dates of his reign are uncertain, but he may have risen to power in the decade ending in 1560 BC or in 1558 BC. With his queen, Ahhotep I, Seqenenre Tao fathered two pharaohs, Kamose, his immediate successor who was the last pharaoh of the seventeenth dynasty, and Ahmose I who, following a regency by his mother, was the first pharaoh of the eighteenth. Seqenenre Tao is credited with starting the opening moves in a war of revanchism against Hyksos incursions into Egypt, which saw the country completely liberated during the reign of his son Ahmose I.